In 2009, I became the HiRISE investigation scientist for Mars Reconnaissance Orbiter, a role I’ve described in a few other places. I’ve seen the team through safe modes, loss of one of their CCDs, two solar conjunctions, imaging MSL on the parachute, figuring out creative ways to deal with constraints that MRO’s job relaying science data from Curiosity places on HiRISE’s imaging capabilities, imaging comets, and lots and lots of glorious images of Mars. Along the way, I’ve made a lot of friends, both with the MRO operations team at JPL and the HiRISE team. The HiRISE operations team is based in Tucson, at the University of Arizona. In honor of their camera, they put “Hi” in front of as many mailing lists and processes or scripts as they can (HiCCUP, HiTList, HiReport, HiOps, HiPPHOP, HiCat, HiDog, HiJack, … ). I have spent most of my time interacting with the HiRISE Targeting Specialists, or HiTS, the folks who do the day-to-day commanding of the individual images that HiRISE acquires. I send them notes from the daily gamut of meetings I attend on their behalf, answer questions from them about what’s going on at JPL, and alert them to “shenanigans” (my preferred term for unusual events) in upcoming planning cycles. The HiRISE science team gets together twice a year, and once a year they go on field trips through areas that include geological features that are analogs to places on Mars. In the course of attending these, I’ve travelled through areas once covered by giant volcanic flows and then cut by giant floods, pushed dry ice down sand dunes, and spent my 35th birthday standing barefoot on a beach made of preserved brine shrimp poo. I’ve done two NASA press conferences for the HiRISE team. 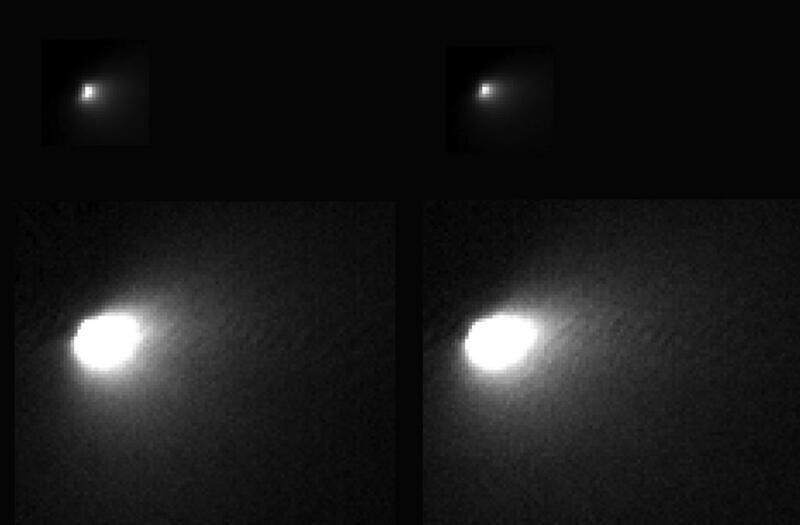 I’ve helped the team as they figured out how to take pictures of comets, starting with last year’s ISON images, which at the time seemed mind-meltingly complicated, as we tried to understand how to take a camera designed to run hot and take pictures of a warm object that fills the entire field of view, and flip it over to take pictures of a tiny, faint object in a cold sky. I’ve been told that interpretive dancing was involved at HiROC (the HiRISE Operations Center) to figure out what was pointing where and where the sun was. As complicated as that was, it seems so straightforward now that we’ve done the Siding Spring campaign! There’s a lot of things out there now about the Comet Siding Spring campaign, including a video about how MRO and the other Mars orbiting fleet hid behind the planet during peak flux, and a NASAsocial about our plans, which can be watched here (I’m briefly in it about 55 min in). But let me tell you, none of that indicates the level of sweat and tears and sheer determination behind the scenes. From the flight engineering team at Lockheed Martin, who figured out how to make the spacecraft do multiple flips every four hours starting 60 hours before closest approach and dealt with ever-shifting instrument desires, to the HiRISE and CRISM teams who figured out how to get their instruments to work in a way wholly incompatible with their design, to the team at JPL who combined our earliest observations with the ground-based comet observations to give us last-minute updates to the predictions of where the comet would be at closest approach (and saved the closest approach images), to the project management who made sure that everyone was dotting their i’s and crossing their t’s – how much did the comet move through the sky between the start of a HiRISE scan and the end of it? Was the spacecraft tracking the comet or pointing at a fixed spot? Were we going to fill up the data storage and start overwriting data before we could downlink it? These images represent a huge amount of work, and I think they are spectacular. More results should be coming from the team in the coming weeks and months. Today is my final day as the HiRISE investigation scientist. I’m now full-time as the Science Systems Engineer for the Mars 2020 Rover. It’s my first mission in development, and it’s my first time having this level of responsibility. I’m looking forward to putting the things I have learned as a member of the operations teams for a diverse set of spacecraft to use as we figure out how we’re going to operate our new martian beast. It’s an amazing growth experience for me, and will put my skill set to good use (and stretch me to learn a whole new set of skills). But I’m sad to be leaving the team of the most awesome camera in the entire solar system, and I wish them every success. I forgot to mention here that I was interviewed over at the Planetary Society – Interview With A Mars Scientist! What is a scientist doing on a mission that does not yet have a science team? When I tell my scientist friends that I work part-time on the Mars 2020 Rover, I usually get confused looks: “But there’s no science team yet, what can you possibly be doing?” Well, quite a lot actually! I officially joined the 2020 mission operations team last fall as a science systems engineer. A science systems engineer is someone who is focused on how all of the rover systems (from the components of the physical rover to the flight software that runs the rover to the ground network that we will use to build the commands during rover operations and process the data that the rover collects) will come together to support the science team. We want to make sure that the people who are funding the rover – that means you, if you are an American – get the most scientific bang for their engineering buck. For the last 9 months or so, M2020 has been in what we call “Phase A” of project design – we are working out exactly what the rover is going to need to do (these are called requirements), paths forward for developing those capabilities, and thinking about how to test and verify that it can do those things before it launches. We are waiting for our science instruments to be selected by NASA HQ from the 58 proposals submitted from the Mars science community; however, even though we don’t exactly know which science instruments we will be carrying, we know the science goals of the rover. We have a Project Scientist (Caltech professor Ken Farley), who is ultimately responsible to NASA HQ for the science achieved by the rover, but he can’t be everywhere all the time and he doesn’t have the familiarity with the engineering side of a spacecraft – so he has two science systems engineers to help make sure that the rover system will allow him and his team meet the science goals. A major difference in science goals between M2020 and previous rovers is the development of a “returnable cache”. This means that M2020 must collect rock samples and put them in a cache, which a future mission could return to Earth should it be funded. The word “returnable” implies requirements for engineering (HOW to fill the cache? ), planetary protection (how CLEAN is the cache? ), and science (WHAT goes in the cache?). This latter component has a lot of implications that could easily be overlooked by the engineers focused on designing the hardware. One of the ways we tried to convey this message to the engineering team was to take some of them out into the field, and show them how a geologist would work to understand the history encoded in the landscape, and what samples would we choose to collect for further analysis. This was a lot of fun, but I’m going to save those stories for now – we’re hoping to put them up on the public M2020 website in the future. Another way to make sure that engineering decisions – even in this early stage of project development – are made with full recognition of the science implications of those decisions is to have a science representative in their meetings. That’s where I come in! One of the many meetings I’ve been attending is the cache hardware design team meetings so that I understand their trade spaces and to make sure they understand our science requirements, attending rover operability working group meetings to discuss how everything from the size of the heaters on the rover to the time that our relay orbiter flies overhead affects how much science we can do in a single Mars year, and where can we make reasonable changes to increase our science return. My job is to jump up occasionally to remind the engineers that we will want to collect soft rocks too (a whole different kind of drilling challenge), or that we need to take all the proper fieldwork-type measurements of the area to understand how the samples relate to the geology of area they were collected from, so we can’t just assume we will spend all of our time drilling or driving. It’s a lot of meetings, and a lot of discussing currently-nebulous design options or philosophical approaches to answering questions. It’s been a huge education for me in terms of developing a spacecraft, and how interconnected all aspects of a spacecraft are. It’s also been a time of emotional strain and growth for me, as sometimes I’ve had to speak up and argue against experienced engineers and managers, all of whom are very confident and not shy to share their opinions. I, on the other hand, am new to mission development, and if left to my own devices can be quite shy and introverted. I had to reconcile the fact that my area of scientific expertise is not astrobiology with the fact that I know more about astrobiology and the science goals of this mission than any of the engineers or managers. I went through a period of scrambling to find my confidence and my voice, but as I’ve gotten to know the team better and settle in to my new role, I have become more than willing to speak up and be an agitator on behalf of the future science team. While it has been fun helping lay the groundwork for the rover, I’m looking forward to when some of these conversations become more concrete. All of us on the M2020 team – and in the Mars scientific community – are eagerly awaiting instrument selection. Soon, I hope! There is a room at JPL that is currently covered in printouts – covering the walls and taped to the windows, stacked on the conference table, and in a few cases accidentally fallen on the floor. Each of these hundreds of pieces of paper is an individual step of logic in the chain that will hopefully take us to another great Martian adventure. This room is called the Mars 2020 War Room. NASA spacecraft missions come in many sizes and flavors. Some are proposed by the scientific community in response to announcements of opportunity (these include the Discovery missions like MESSENGER and the New Frontiers missions like New Horizons). Some are pre-chosen by NASA to have a particular destination (these include flagship missions such as Cassini), and the scientific community proposes instruments to go on these spacecraft in order to carry out the measurements needed to answer the science questions that this spacecraft is intended to address. Before those instruments can be identified, a team of scientists is assembled to figure out what those science questions should be and what kinds of measurements are needed to address those questions. This is a science definition team. Back in December of 2012, the associate administrator for NASA’s Science Mission Directorate (the part of NASA that includes all robotic solar system exploration) announced a plan to essentially rebuild and refly the Curiosity rover system in 2020 with new scientific instruments to answer new questions. NASA set forth an initial set of questions; a science definition team was put together to figure out if those were the right questions and how would we put together a realistic mission to answer them. Realistic is important: this encompasses if there are instruments in existence that can make the measurements, are those types of instruments affordable, and can we collect enough data in one Mars year of operations to answer the questions. The Mars 2020 Science Definition Team (SDT) got started at the end of January, and turned in their report is to NASA on July 1. On July 9th, the report was released to the public; you can read it here (http://mepag.jpl.nasa.gov/reports/mep_report.html) and watch a video about the science goals here (http://mars.jpl.nasa.gov/m2020/multimedia/videos/index.cfm?v=133). The punchline is that we want to look for the signs of past life on Mars via a suite of instruments onboard the rover combined with collecting rocks to eventually bring back to Earth to analyze for signs of life using terrestrial laboratories. This is very exciting to a Mars scientist – we’ve been trying to do Mars Sample Return for decades, and NASA has always been reluctant to take the first concrete steps before now. I’m not going to go into details of what we want to do right now, as I hope there will be plenty of time for that in the future; check out the video to find out more. Or, you can read our report! The report is where I come in. I am the SDT Documentarian, which basically means that I am the keeper of the documents – multiple team-internal powerpoint files (each of more than 100 slides) and the final report (just over 200 pages). I wrangled figures, files, meeting notes, and text so that the SDT didn’t have to, and I made sure that their thoughts are captured electronically so that the science content and logic is there but in a way that a non-expert can understand it. (To be clear: all the intellectual content was generated by the people on the SDT and not myself.) It’s the sort of task that requires someone with a scientific background (in order to understand the conversation and make sure the important parts are captured) but who is willing to be a beast of burden (in order to pull together the inputs, edits, and quibbles of ~20 very smart people). I helped to keep the train running so that the SDT could decide where it is going. I work for two people here at JPL who have been stoking the fires and making sure that track exists, and I run around doing what I can for them so that they are free to keep their eye on the horizon. It’s been fun and intense. I’ve spent a lot of late evenings gathering up and reconciling inputs, and turning around a new product to the SDT so that it is sitting in their inbox for them to start working on afresh as soon as they get in the office in the mornings. I’ve worked with some of the team before on other missions, including Curiosity and Mars Phoenix. One was a researcher in my department at grad school and another served on my Ph.D. thesis committee. I’ve been struck by their dedication: unlike myself, they are volunteers and not getting paid for this work, and they have put in a lot of time into nailing down the precise wording of their findings and arguing their way through the logic of each step in the chain, simultaneously with teaching, participating in MER and MSL operations, and doing their own research. If all goes well, later this year NASA will release an announcement of opportunity to the community and people will be able to propose instruments to go on the rover. I think this would be a very exciting mission, and I hope that the rest of the planetary community and NASA agrees with me. Even at this stage, this is still just a proposed mission, and I’m not sure what role if any I will be playing in its future, but I hope it will take us all the way to the surface of Mars – and maybe even return some of Mars back here to Earth. You can keep an eye on our progress at the official Mars 2020 website, http://mars.jpl.nasa.gov/m2020/. I’ve got a post up at The Space Place’s Mission Chronicles on my work for the Curiosity Rover. I’ve got several talks coming up in the next few weeks, including at GallifreyOne, the Doctor Who convention in Los Angeles. My name is Sarah, and I work at NASA's Jet Propulsion Laboratory. I am a planetary geologist by training, and I have worked on the science operations teams for many spacecraft, including Mars Reconnaissance Orbiter, Mars Science Laboratory, Cassini, and Mars Phoenix. All opinions on this blog are my own, and not NASA's.